We offer comfortably equipped accommodations and the chance to escape from daily routine and to enjoy the essence of Mediterranean life: the sun, the clear blue sea and most of all yourself in the middle of it! A shared grill place in a green environment (vegetable and flower garden). WI-FI and a private parking are also free to be used by our guests. The apartment is located in a child-friendly environment (pebble beaches, playgrounds nearby), and has full baby equipment (baby cot and high chair - on request). Mlini is a village placed in a beautiful bay between the Dubrovnik city and the Dubrovnik airport (approx. 10min drive in each direction). The area has numerous pebble beaches, various cozy restaurants and bars offering memorable views while enjoying the Mediterranean tastes. Just meters away from our house you will be able to find 2 bakeries. During the summer time, it is not rare that you can enjoy a water polo game in Mlini which sometimes gets very exciting and might end with a party! A bus stop is located about 3 min walk from our house. Public buses run every 0,5h-1h to Dubrovnik on one side and Cavtat on the other side, both can be reached within approx. 20min. In case you are arriving by your own vehicle, then you can reach both Dubrovnik and Cavtat within 10min. There are also boat connections to Dubrovnik & Cavtat which run several times a day and give you the opportunity to see this lovely area from the sea side! Since we also live in the house (ground floor), we will be at your disposal advising you in fluent German and English. My family will be happy to be your host this summer and show you the beauties of the Dubrovnik area! Placed in the hall, so it can cool down the whole apartment (free of charge). We stayed for 2 weeks in Maria's apartment and it was everything we hoped for and expected. Very clean, well equipped, comfortable beds and very helpful and friendly hosts in Maria and her parents. They were very welcoming and helped us book a local restaurant (King) which was the best one we visited in the area. Lovely views from the balcony and very good local amenities and shops. Mlini is a really pretty and pleasant resort which is well linked to Dubrovnik and the islands. One of our best finds though was the Konavle and, in particular, the beautiful fishing village of Molunat. Only 30 min drive from Mlini and a really pretty and relaxing place to visit. Beautifully clear waters, great restaurant overlooking the bay and a really chilled out feel. Such a contrast to the hustle and bustle of Dubrovnik old town. Cavtat too was really pleasant and a delightful walk around the headland. Warm welcome from Maria and her family. Everyone has been available and helpful when needed. Apartment was very clean. We had everything we need for 5 people. Wonderful view from the terrace. Perfect for our stay. Our stay in Mlini was fantastic. Mlini itself is perfect for a quiet getaway, and has everything you could possibly need within walking distance, including several excellent beaches. The food & drink in the area is also fantastic. The hosts were also incredibly kind, charming people. They were never far if we needed anything and were always happy to help. 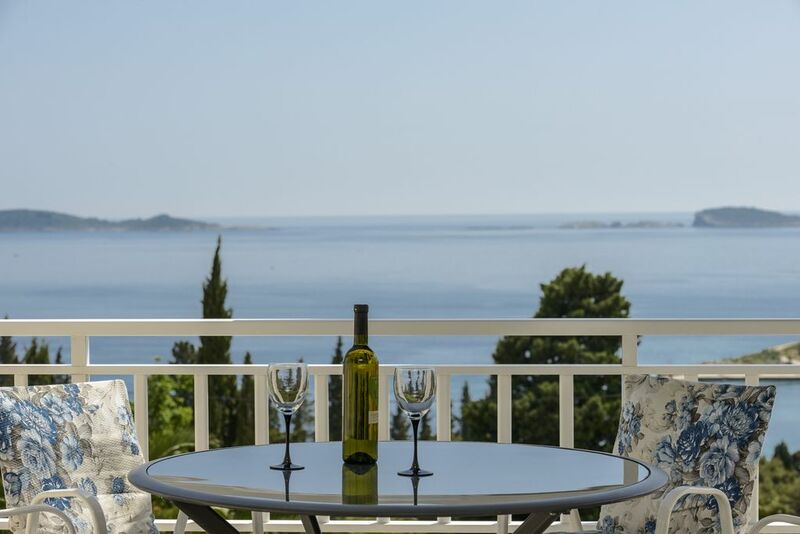 The apartment is also exceptionally clean, is fully equipped, and boasts gorgeous views from the balcony, where you can have dinner and watch the sun set by the Adriatic Sea. The walk down to the beach area is very short but also very pleasing to the senses, with scents of pine trees mixing with the clean coastal air, and clean, crystalline water waiting for you at the beaches. Something to look out for is the return boat trip to Dubrovnik Old Town - incredibly affordable and a great way to do a day visit. One final thing I observed is that Croatians are incredibly multilingual and I witnessed people of multiple nationalities speaking their native tongue with the locals. Needless to say, therefore - English is spoken absolutely everywhere, which was useful for me! Although I do recommend learning a few Croatian words/phrases, just to return the favor! Thank you so much for your kind review and comments, which I am sure will help future guests to imagine the area and make a decision in visiting Mlini. Das Appartement war sehr sauber, ruhig und gemütlich und wir hatten einen wunderschönen Blick aufs Meer von der Terrasse. Der Strand, der Bus nach Dubrovnik und ein Supermarkt waren sehr schnell zu erreichen. Unsere Vermieter waren sehr nett und wir hatten eine sehr schöne Zeit in Mlini. Wir können die Wohnung wärmstens weiter empfehlen. Lovely two bedroom apartment in a good location, very welcoming hosts! We have just returned from a 5 night stay in Mlini and had a great time. We were very well looked after by Jelena, Ivo and Maria, who were always on hand to help out if we needed anything or any advice or tips on the area. They were very welcoming hosts indeed! The apartment is well located, you can walk down to two separate beaches, one just over 5 minutes away (longer on the way back up) and Mlini harbour with its beautiful setting and bars and restaurants is less than a 10 minute walk. You can also drive to nearby beaches and Dubrovnik itself if you have a hire car. It is a great apartment for couples or families, it was lovely to eat breakfast and dinner overlooking the sea. It was a pleasure to be your hosts and we surely hope to see you again in Mlini!